Born in Vevey in 1976, Antonin Scherrer is a writer and music critic. Curator of the Musée Paderewski in Morges since 2016, producer of musical programmes on RTS-Espace 2 and teacher at the Haute Ecole de Musique in Lausanne, he has written around twenty works on music, among which are monographs dedicated to Victor Desarzens, founder of the Lausanne Chamber Orchestra (L’Aire, 2008), to the composers Raffaele d’Alessandro (Papillon, 2009), Jean Perrin (Infolio, 2013) and Samuel Ducommun (Infolio, 2014), to the Lausanne Vocal Ensemble, to the Lausanne Conservatoire (Infolio, 2011), to the Montreux-Vevey-Riviera Conservatoire (2015), to the Lausanne Chamber Orchestra (2017), the pianist Paul Badura-Skoda (Bibliothèque des Arts, 2014) and to the violinists Pierre Amoyal (Bibliothèque des Arts, 2014), Emile de Ribaupierre (Infolio, 2015) and André de Ribaupierre (Infolio, 2017). 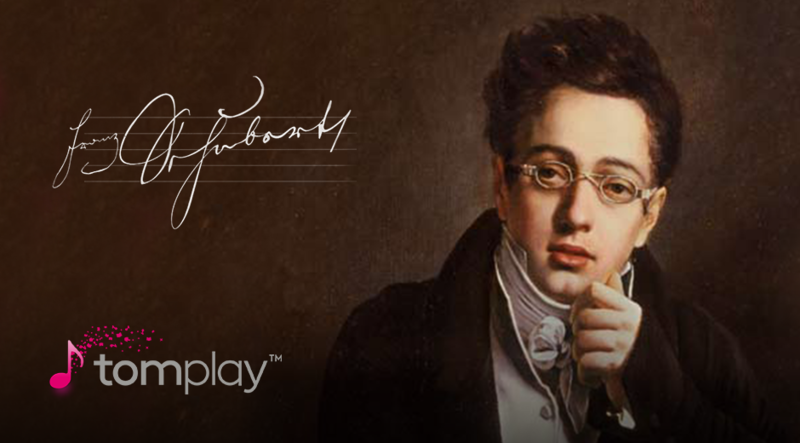 On the occasion of the anniversary of Franz Schubert’s birth, we propose you discover ten of his most beautiful pieces for the piano, either original or arranged by Tomplay for pianists of all levels. Play the score of the Schubert Serenade arranged for beginner, easy or intermediate level solo piano. Play the score of the Schubert Serenade arranged by Liszt for solo piano. Thirty-one years and more than a thousand works on the clock: Franz Schubert is a real meteor in the heavens of classical music. Among his thousands of works, more than 600 are lieder - melodies: the favourite genre of romantic Germans. The beginning of the 19th century witnessed an overflowing abundance of poetry. Writing was frenetic: it is said than more than ten lieder could spring forth in just one day! “Ständchen” - the “Serenade” we are inviting you to play alone or with the orchestra - is taken from a cycle which is unfortunately aptly named, “The Swan Song” (“Schwanengesang”). This collection of 14 lieder was thus named by the editor Tobias Haslinger at the time of its posthumous publication: he doubtless wished to present this bouquet of melodies, which are sublime but have no link from one to the other, as an artistic testament to the Viennese genius who died of syphilis in 1828. “Ständchen” borrows its lyrics from Ludwig Rellstab. Two favourite romantic themes are brought together here: love and night-time. “Silently my songs beg / Through the night to you / Down into the quiet grove, / Darling, come to me! [...]”. Play the score of the Fantasia by Schubert arranged for very easy, intermediate or advanced level solo piano. Play the original score of the Fantasia by Schubert for piano four-hands. With the Fantasia in F Minor D. 940 for piano four-hands, written during 1828, the last year of his life, Schubert approaches perfection, stimulated by the strongest of potions for inspiration: love! The waves of this impossible - but requited - love which he felt for his royal pupil Caroline Esterhazy appear to dictate each of the contours of the score. He went as far as declaring, “Are not all my works dedicated to her?”. But his social standing prevented him from giving substance to his feelings. So he wrote, wrote and wrote some more. The result: a work in four parts, of extraordinary richness, in which we can glimpse Barbarine’s cavatina from the Marriage of Figaro by Mozart (1st part), Bach and Handel (2nd) and even the grace and charm of Vienna (3rd). Play the original score of Schubert’s Impromptu No. 3 for solo piano. In the same spirit as the poetic impromptu - a short piece in verse composed on the spot and without preparation, “in promptu”, in other words “on hand” -, the musical impromptu is a free-form work in which the composer pretends that it is a sort of instant improvisation. Schubert delivered two series of four impromptus between 1827 and 1828, towards the end of his short, but dramatic life. The whole range of emotions can be found there, in extraordinary spontaneity. Take the Impromptu No. 3 in G Flat Major from the first cycle (D. 899, Op. 90): doesn’t it appear to flow out of the pianist’s fingers as naturally as a waterfall? Play the original scores of Schubert’s Six moments musicaux for solo piano. No. 1, No. 2, No. 3, No. 4, No. 5, No. 6. Autumn 1827. Schubert is thirty years old. He is just finishing his most famous lieder cycle, “Winterreise” (Winter journey”). After that, nothing will be the same. Written between this Autumn turning point and September 1828, his three last piano sonatas (D. 958 to 960) appear more than any other works of this time to be haunted by the solitary Winter journey of this “Wanderer” - this shadowy traveller in whom it is so tempting to see the silhouette of Schubert. Composed only a few weeks before his death, the Sonata No. 20 in A Major D. 959 is so full of contrasts each one more striking than the last, taking the listener from one recess to the other in the catalogue of human emotions, such as the slow movement in F sharp minor which acts as its centre of gravity. Following an almost hypnotic principal theme, the middle section unleashes music of extreme violence, close to chaos, whose fire is only extinguished right at the end in a fragile recitative. You have to wait for the last two movements to see the light once more. On 26th March 1828, in the splendour of the great Musikverein (where nowadays the famous New Year concerts by the Vienna Philharmonic Orchestra take place), Schubert and his friends organised the only public concert consecrated to his works ever given in his lifetime. Not that Schubert was particularly unknown in Vienna, but he was simply reduced in people’s minds to the role of a composer of lieder and choral works. Among other works on the programme was his Trio with piano No. 2 in E Flat Major D. 929. Dating from November 1827, it is one of the rare works of Schubert to have been published as soon as it was created. Its second movement, in which a heavy atmosphere looms evoking that of the first lied of the “Winterreise”, takes its inspiration from the Swedish melody by Isaac Berg (“The sun has set...”) heard a short time before. In the 20th century, it gained worldwide fame thanks to the film “Barry Lyndon” by Stanley Kubrick. Play the score of Schubert’s Ave Maria arranged for very beginner, easy, intermediate or advanced level solo piano. Is Schubert’s Ave Maria too popular? This is what some critics think, given the innumerable adaptations (more or less gratifying, it’s true) which the work has undergone since its creation in 1825 - starting with its transformation into a sacred work by replacing the original lyrics with the Latin Ave Maria from the catholic liturgy. But this can take nothing away from the exquisite melody, a very simple prayer addressed to the Virgin Mary by the Lady of the Lake, the heroine of a poem by Walter Scott, imploring her to protect her father, with whom she has escaped into a grotto. This Lady is Ellen Douglas and she is at the centre of a fight to the death between the Scottish clans of the Lowlands and Highlands, according to Schubert, she should be honoured in the title of this lied: “Ellens Gesang III, Hymne an die Jungfrau” - literally, “Ellen’s Third Song, Hymn to the Virgin”. Rossini had dedicated a whole opera to her some years earlier, entitled “La donna del lago”. Play the score of "Gretchen at the spinning-wheel" by Schubert arranged for very easy, easy or intermediate level solo piano. Play the scores of "Gretchen at the spinning-wheel" by Schubert arranged by Liszt or Horn for solo piano. “No-one’s serious at seventeen”, Rimbaud said. We’re not sure... It’s the age for first heartbreaks and their occasionally devastating consequences. Or at least very serious ones, like Schubert who, having fallen hopelessly in love with a young singer named Thérèse Grob, made a musical translation of the Goethe’s poem “Gretchen am Spinnrade” (“Gretchen at the spinning-wheel”) which is much more sorrowful than the original: Gretchen, abandoned by Faust who had seduced her, lacks not only his kisses (“Ach, sein Kuss”) but it aware of having lost her past innocence for ever. Play the score of the Military march No. 1 by Schubert arranged for piano four-hands at beginner, easy or intermediate level. Play the original score of the Military march No. 1 by Schubert for piano four-hands. The three Military marches saw the light of day at the summer residence of Count Johann Karl Esterházy, at Zseliz in Hungary (now Želiezovce in Slovakia). Schubert was teaching music to the daughters of the count there and it was for teaching purposes that he gave them these pages for piano four-hands, all written in a ternary structure (in other words, in three sections and two musical A-B-A ideas, B taking the form of a trio). The first, in D Major, quickly became the most popular, to the point of being known now as “The Military March” by Schubert. It’s not surprising that it can be found in the repertoires of orchestras, brass bands and other military bands! Play the score of "Death and the Maiden" by Schubert arranged for very easy or easy level solo piano. This is a visionary work. An overwhelming “act of faith” in which Life sustains a brilliant - yet unequal - face-to-face with Death. Schubert’s Quartet No. 14 in D Minor “Death and the Maiden” owes its name to its second movement, a theme of variations on a lied (“Der Tod und das Mädchen” D. 531) composed by Schubert in 1817 from a short poem by Matthias Claudius. At the time, he was just twenty years old and appeared to have already understood all about life. Here, we are proposing an easy version for piano of the first bars of this second movement, where your fingers are called to take the place of the bows of two violins, a viola and a cello - the four members of the original string quartet.